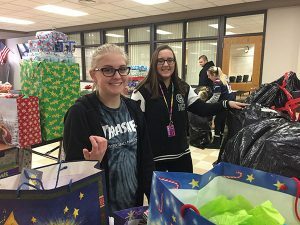 For the fourth year, National Honor Society sponsored the Adopt-a-Family event, providing 70 families from the northern Chicagoland area with Christmas gifts. The effort includes collecting “wish lists” from families in the community. 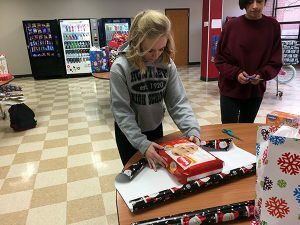 Sports teams, departments, clubs, and groups from Huntley 158’s elementary schools, middle schools, high school, and District Office then “adopt” families to provide them with items from their wish lists. The project began as a high school effort. This year groups from the entire district got involved. 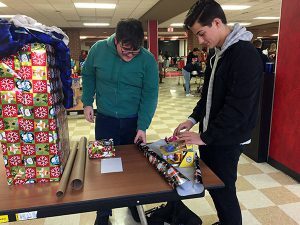 The collected items were brought to the high school on December 12 for wrapping, packing, and delivery to families. Students led the efforts. “The first year, the U-Haul was about half full. This year, we could not fit all of the gifts in the U-Haul. We had to make a second trip,” Lyons said.